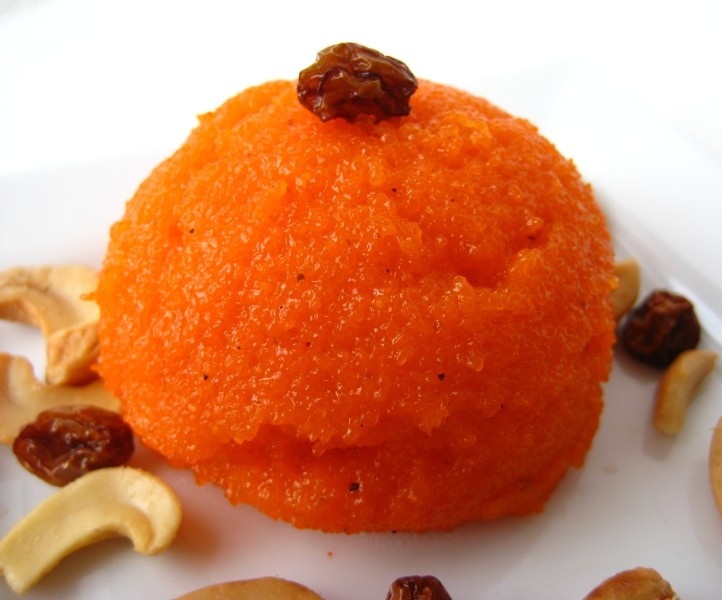 Rava Kesari: Rava kesari is an Indian dessert that is popular throughout the country originated from the Karnataka. It is a Cuisine of Karnataka and is a popular dish during festivals such as Ugadi. Though it is a sweet dish, in Karnataka, it is prepared not only as a sweet dish but also for normal breakfasts. It is also served with Uppittu or Khara Bath and both the dishes in equal quantity one plate is popularly called as the “Chow Chow Bath”. In North India it is served as a sweet dish called Sheera or Suji/Sooji Halwa. Grease a plate with few drops of ghee. Heat 1tbsp of ghee in a frying pan. Fry the cashews and raisins till golden brown. Remove the fried dry fruits from heat. In the same frying pan, roast the semolina, on medium heat stirring continuously, for 4 minutes or till u get a nice aroma. Transfer the roasted semolina to a dry plate. Boil 2 cups of water in the same pan. Add in a pinch of salt and saffron colour to the boiling water. Let the water boil for a few minutes. Add the roasted semolina from one hand and stir the mixture using a ladle in the other hand. Mix well till all the water gets absorbed by the semolina. Note: Take care, during the cooking the hot semolina splashes. Cover and cook the semolina, stirring continuously, for 5-6 minutes in low flame. Add in all the sugar. Remove the frying pan from heat. The mixture will become watery and small lumps may have formed here and there. Keep on stirring vigorously and the lumps will break and the mixture becomes thick. Note: After adding the sugar, if u keep mixing on fire, more lumps may form. So mixing off fire helps to reduce the lumps. Keep the mixture on medium heat. Mix until all the sugar dissolves and mixes with semolina. Mixture will become slightly thick. Add in 1 tbsp of ghee and green cardamom powder. Rava kesari will start to leave the sides of the frying pan. Transfer the rava kesari to the greased plate. Note: To check the consistency of rava kesari , slightly wet your fingers in water and touch the rava kesari. If the finger is non-sticky , rava kesari is done; if not , heat the mixture on medium heat and mix for a minute. Level it with a back of ladle greased with ghee. Scoop the rava kesari (or cut into derised shape) on the serving plate. Serve rava kesari hot or at room temperature. If you have any queries regarding the Rava Kesari recipe, please leave a comment.